Balsams developer Les Otten is pictured talking to InDepthNH.org reporter Paula Tracy about his vision for the project at the Legislative Office Building in Concord. The Balsams in Dixville has been closed since 2011. InDepthNH.org reporter Paula Tracy recently took this shot. co-published with the New Hampshire Business Review and other news outlets across the state. The other stories will be posted on Tuesday and Wednesday. 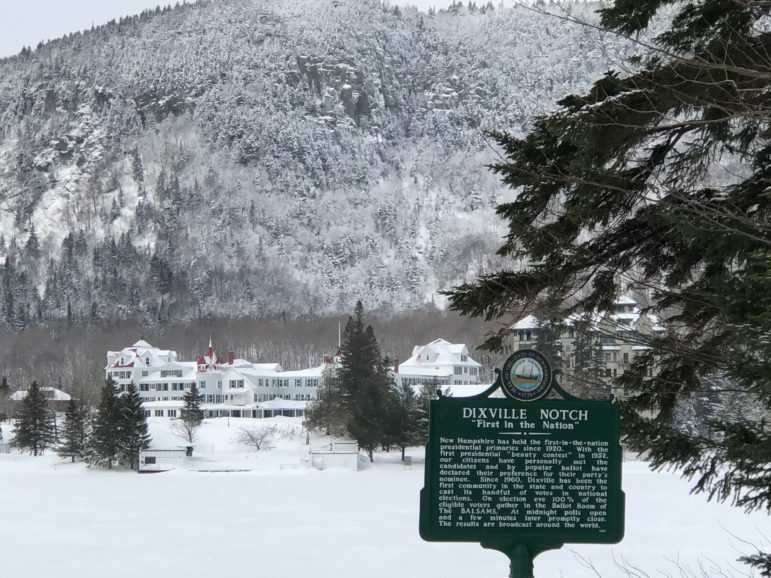 DIXVILLE – North Country residents wonder whether redeveloping the Balsams Grand Resort will recreate its elegant past and be the catalyst for a world-class outdoor economy they desperately need in the Great North Woods. Or will the grand old hotel just continue to deteriorate. Or perhaps worse, undergo redevelopment only to flop and leave taxpayers footing a $28 million bill. Now that the New Hampshire House has passed enabling legislation by a wide margin to make financing possible, with the Senate set to take up House Bill 540 next, we will all have a better idea. Laura Clarke of Colebrook is among the many hopefuls who are rooting for the Balsams’ resurrection. “It would mean a great deal to the community to have the Balsams back open,” Clarke said. “It would be great for revenue for the town.” Its famed Panorama Golf Course designed by Donald J. Ross is in Colebrook, she said. Clarke lost her job as a chambermaid at the Balsams after five years when it closed in 2011. Now, she works as a clerk at a local pharmacy. “For the economy, it would be absolutely wonderful,” Clarke said. 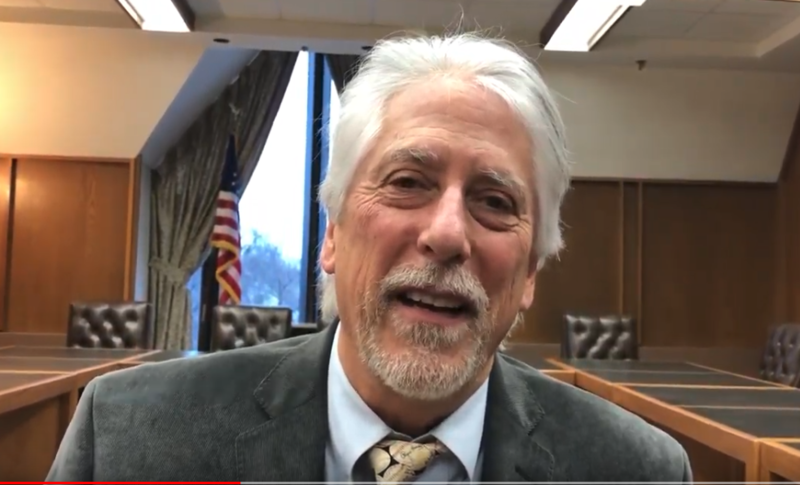 House Bill 540 would create a tax assessment district for redevelopment, allowing Otten to access the bond market with no liability, for what he calls the “forgotten county” of Coos. After fits and starts over the last five plus years to obtain the $173 million financing needed for the first phase of development, Otten said the project’s future now is in the hands of state lawmakers. At the same time, he is ready to move ahead quickly. 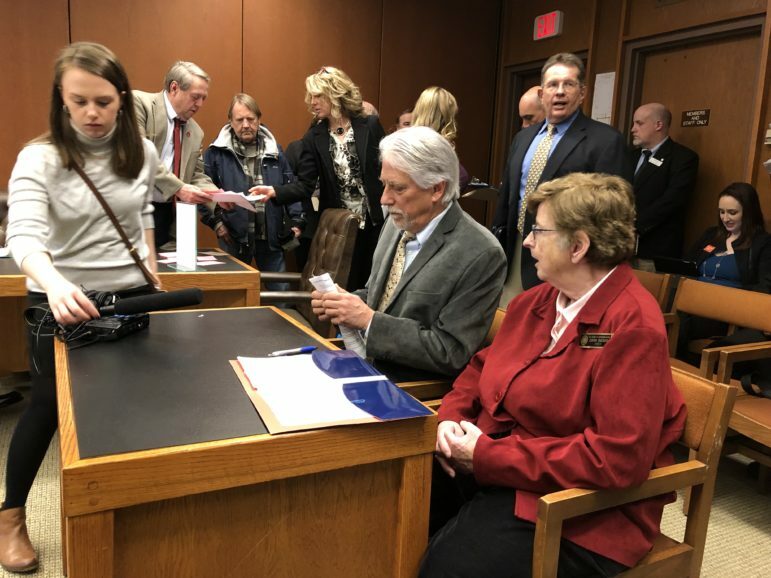 Otten, who is former CEO of the American Skiing Company and was a minority owner of the Red Sox, has spent time this session in the state Legislative Office Building in Concord selling House Bill 540. The bill is critical to the Balsams’ future, he said, as it would allow Coos County to create an assessment district for redevelopment in an unincorporated place. Balsams developer Les Otten talks about the benefits of having the nearby airport in Milan. Otten’s project has critics like Rick Samson, the only one of three on the Coos County Commission to oppose the county’s involvement in any way. Otten shrugs off naysayers. “I want to put people back to work,” Otten told New Hampshire lawmakers. The remote Balsams area – 60 miles north of Mount Washington and just a 20-mile jaunt to the Canadian border – is different than just about anywhere in the country. The area is an outdoor recreation destination similar to Royal Gorge in the California Sierras. The Balsams has about 100 kilometers of cross-country trails, which have been closed since the hotel was shuttered. A variety of accommodations draws folks here: camping, motels, hotels, vacation homes and condominiums, time shares, cabins, rentals of all sorts – and a few grand hotels. Whittled down from more than 30 grand hotels at one time, fire and time have consumed all but three other historic grand structures in New Hampshire, two up north: the Omni Mount Washington Hotel in Bretton Woods, the Mountain View Grand in Whitefield and Wentworth-by-the Sea in New Castle. Recreating the Balsams – drawing skiers from Montreal only three hours away, Boston and points across the Northeast – where snow sports and open spots for playing in the snow are shrinking – and building the largest resort in the East with all-new equipment could be the much-needed catalyst for the region’s many outdoor opportunities. Otten says he is going after more than the weekend crowd, envisioning the average visitor may stay two weeks or more, and those guests will want to do things off-property as well. The prospect for jobs at the resort and surrounding area seems tantalizingly close with the progress of House Bill 540. But it may be unrealized. It might continue to be a best-kept secret among outdoor aficionados if the $173 million in financing does not come together. After more than five years of planning and permitting for the redevelopment of the resort, Otten is not giving up. He hopes to create the largest ski resort in the East on 11,000 acres. Otten, 69, of Greenwood, Maine, has become a familiar face at legislative hearings in Concord. Wearing a blue suede jacket in the lobby of the Legislative Office Building recently, Otten was working his cell phone, too, on what might be his last shot to revive the hotel. Otten and investors plan to plunk down $20 million of their own money, obtain a construction loan of $85 million, secure about $40 million from a new federal Opportunity Zone program and get a $28 million Tax Increment Finance District (TIF) bond to make up the financial package to move forward. This would enable Coos County to consider creating a $28 million TIF bond, which would then need to be authorized by the three-member county commission and approved by the 10-member county delegation. The bond would be paid back from revenue from improvements to the resort until maturity at about 20 years, with interest. Les Otten and Rep. Edith Tucker prepare to speak to lawmakers recently in the Legislative Office Building in Concord about the Balsams redevelopment. Berlin Mayor Paul Grenier is pictured standing behind Otten. NHPR investigative and data reporter Casey McDermott is seen preparing to record the testimony. If the project goes bankrupt, investors, not the county, would be on the hook, according to HB 540 sponsor Rep. Edith Tucker, D-Randolph. It would be up to the Balsams to find an investor to take the deal with no municipal guarantee, Tucker said. If the Senate approves Tucker’s bill, it would go to the governor who must also sign off. Otten has secured non-binding deposits from 120 investors, many of them former hotel guests, to buy into the redevelopment. Otten said there are another 450 to 500 “queued up” to invest if the bill is passed and the $173 million financing package comes together. If approved, “the growth will be rapid,” he assured, meaning 400 permanent jobs and at least 600 construction jobs for the first phase. His long-term vision is to create a ski resort larger than Killington, Vt., where he began in 1971. His plans call for a gondola to be built from the hotel across Route 26 to the mountain summit where there would be 22 lifts and more than 1,200 acres of skiable terrain. Otten’s support of renewable energy, specifically hydro, has landed him in some hot water. He has been roundly criticized by residents in the North Country for taking $5 million from the developers of Northern Pass to help with pre-development of the Balsams. Many in the North Country oppose the plan by Eversource to build a 192-mile transmission line from Pittsburg to Deerfield to bring electricity to the Massachusetts market. The project is appealing the denial of a permit to build to the state Supreme Court. Opponents of Northern Pass and House Bill 540, including Rick Samson, have said they would like to see the Balsams revived but without help from the county. Samson said he wants to avoid any county losses, but he’d be happy to take the money for tax coffers if the project can happen without the county’s help. But without the bond, there will likely be no project and no improvements, Otten’s supporters say. Otten said he was overjoyed in 2015 when the legislature gave him a tool he thought would help secure bonds for the project. It included the requirement that the $28 million bond had to be approved by the state’s Business Finance Authority. An effort to secure that deal fizzled in August 2018 when Service Credit Union of New Hampshire withdrew its request to the BFA, citing irreconcilable differences. Steve Duprey, vice chairman of the BFA, said the issue was not about the worthiness of the project or its viability, only about a state-guaranteed portion of the deal. Otten sought a market for bonds without municipal backing. Such a financing plan would require more interest or incentives, but he believes there is a market for it, and the project can absorb the extra costs. Economists say a lot has to go right and nothing can go wrong for Otten’s financial plan to work. But they say there is a path forward with this, and the timing with a strong stock market and a new federal program is better now than five years ago. They did not have opportunity zones then, for example. Last summer, as part of the Tax Cuts and Jobs Act of 2017, Republican Gov. Chris Sununu nominated Dixville and 26 other tracts across the state as Qualified Opportunity Zones. The purpose of the zones is to get economic investment and job creation in low-income areas of the country. The investors put their money in an OZ fund and then get to defer capital gains and other tax incentives in exchange for investing. Scott Tranchemontagne, spokesman for the Balsams, said, “Our project would qualify for an Opportunity Zone and we intend to offer that investment” by creating an opportunity fund for the Balsams. Duprey at the BFA, who is also a well-known Concord developer, said the new “OZ” program offers great promise for not only the Balsams, but other areas in the state where tax incentives could help bolster an area’s economy. Michael Swack, a professor of economics and management and fellow at the University of New Hampshire Carsey Institute and the Peter T. Paul College of Business and Economics, said he is not familiar with the specifics of the Balsams project, but agreed with Duprey about the timing of the zones. The opportunity zone option comes at a good time for the project and the region. Big banks are setting up mechanisms for investors to take advantage of these zones at the same time projects like the Balsams are creating funds to take the money. Swack said the fact that the Balsams project is not looking to get traditional TIF bonds through government backing is not extraordinary but may mean that the developer would have to pay more interest or other incentives than a traditional TIF, which is backed by a state or municipality. While the county may not be on the hook to repay if the project goes south, he said, it could be criticized for helping the private project by creating the bond that allows it to go forward. Swack said the county is just “creating the tool” under House Bill 540 but “someone else is taking the risk” and that would be the investor. The investor would want to see some assurances, for example, that the developer’s money is used first or at the same time. Otten told legislators that would be the case and he has also said the investors would be in the number one position for repayment if there is a bankruptcy. Berlin Mayor Paul Grenier is a strong supporter of the Balsams project. He envisions Berlin Regional Airport in Milan as “a true diamond in the rough waiting to be polished. “There’s huge potential, here,” and it could be fueled at the airport by a reopened resort, said Grenier, who has been a frequent visitor at the Legislative Office Building testifying on behalf of the Balsams, education funding and other projects that would help Berlin get back on its feet. The loss of the mills and manufacturing in recent years have made for tough times, and people have moved away from the area. Grenier noted that Berlin once had 22,000 residents. It now has about 10,500. Colebrook had close to 3,100 residents when the Balsams was a big employer, but it is now down to about 2,100 residents. In Errol, Bob Ouellet operates a local store on Main Street about halfway between the airport and the Balsams. While the Balsams opening would help property values and reduce unemployment in the region, Ouellett was concerned that county taxpayers could be left hanging if the project goes bankrupt. Ouellett also worries about House Bill 540. “I may not be a financial wizard, but how can you sign for something and still not be on the hook for it?” Ouellett asked. The developers sent out a postcard several years ago directing former Balsams guests to a website describing opportunities to buy into the project, somewhat like a timeshare. Using a database that includes the names and street addresses of some 90,000 former guests, it is the only marketing effort so far. Otten said 120 families have signed non-binding, refundable deposits, which would give them 100 days of hotel room ownership with a chance to “give back” a majority of those days for the hotel to sell. This could mean $22 million for the project, Otten said. He estimates another 400 or more are ready to sign. The plans include retaining a culinary focus and cooking school, working with local farmers to provide a farm-to-table menu, building a hot spring and Nordic spa to take advantage of the cold mountain streams, and building a core resort center where people would park the car for days on end and walk, ski, bike, or run to all the recreational activities from the center area. During the first phase of construction, the ski area would include about as much terrain as is now available in Stowe, Vt. This area of the state is one of the snowiest, according to the National Weather Service, and the base of the ski resort at about 1,754 feet, among the highest of any ski area in the state. According to a recent study by the University of Waterloo, Ontario, by the turn of the century New Hampshire will have only a handful of remaining, operable ski areas because of climate change. The Balsams is on that list of remaining areas, based on elevation and latitude. Otten said he believes the development plans would lift all boats and that a large number of existing recreational businesses could profit. “People who have not ventured north of the notch are missing out on the best of New Hampshire,” Otten said. While there’s a lot to consider, former chambermaid Laura Clarke said she has not lost hope. Clarke misses the hotel guests and vibrancy the Balsams provided her community and the pride she took from their enjoyment. “They came year after year after year,” Clarke said from all over the country and all over the world. This article has been published jointly by NH Business Review and IndepthNH.org, New Hampshire’s nonprofit news website published online by the NH Center for Public Interest Journalism.